So, bacon is all the rage right now. Bacon and chocolate, bacon and popcorn, bacon and… pretty much anything. Bacon, bacon, bacon. I’m actually not sure why it’s so trendy now; I mean, isn’t bacon something that most people (aside from vegetarians and vegans) have loved since they were a kid eating breakfast on Saturday morning? I, personally, am one of those lifelong bacon lovers. BLT’s, bacon cheeseburgers, bacon and eggs, bacon and pancakes, bacon in mac n’ cheese, bacon and… pretty much anything. Love. 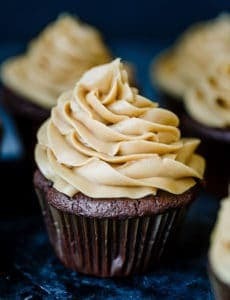 And so these cupcakes? Absolutely love. I thought, what naturally goes better with bacon than pancakes and syrup? Not much else, and so these babies were born. The cupcakes are made from a homemade pancake batter and baked up in a muffin tin. They are light and airy on the inside, just like a wonderfully fluffy pancake should be. 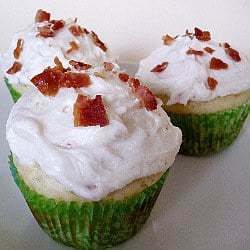 The buttercream frosting is spiked with maple syrup and crumbled bacon. It’s important to note that unless you have a large, round decorating tip you are not going to be able to pipe the frosting onto these cupcakes. As you might imagine, the bacon will get stuck in the decorating tip. So just slather it on and call it rustic. And quaint. And then take a huge bite and savor all the salty sweetness in all its glory. If it’s 8am call it breakfast; if it’s 8pm call it dessert. You can’t go wrong either way! 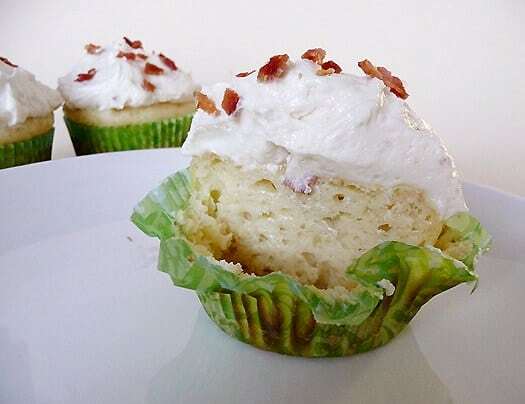 Next time I think I’m going to make a few extra pieces of bacon, crumble them up, then drizzle some maple syrup over, toss together to coat, and then fold into the cupcake batter before filling the muffin cups. The more bacon, the merrier, right?! What’s your favorite bacon “dish”? These cupcakes taste just like breakfast! 3. To make the frosting, use the whisk attachment of a stand mixer to whip the butter on medium-high speed for about 5 minutes, scraping the bowl as needed. Reduce the mixer speed to low and add the powdered sugar a little at a time, waiting until it's mostly incorporated before adding more. Once all of the powdered sugar has been added, scrape the sides of the bowl and increase the speed to medium-high and whip until fluffy, 1 to 2 minutes. Add the maple syrup and the vanilla and whip for another minute or so to incorporate. Add the bacon and mix to combine. Using an offset spatula, spread the frosting on the cupcakes. Top with additional crumbled bacon if desired. I’m going to half the recipe and make them minis. I LOVE your cupcakes! You make these amazing recipes of all kinds! And i’ll be darned I never would have though of a breakfast CUPCAKE! I made these to take to a church work day and they were a perfect start to our day. I received tons of compliments! They are just the right amount of sweetness. Delicious! I was wondering if you can use complete pancake mix instead? Hi Tara, I have not tried that so I’m not sure how it would work, but it’s always worth a try! I made these yesterday. My husband and I think they are yummy, the other 4 people that have tried them think the strawberry and chocolate cupcakes are better. 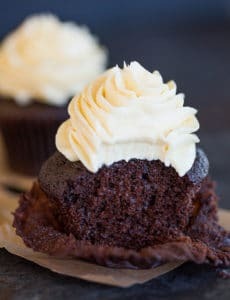 I think if you are open to different tastes and not cupcake = light and fluffy with sweet icing then you will be pleasantly surprised by these cupcakes. Of course they are not like “normal” cupcakes, they are made from pancake batter, but the way the bacon flavour kicks in to balance the sweet icing is very nice. These look awesome and easy, I can’t wait to make them! 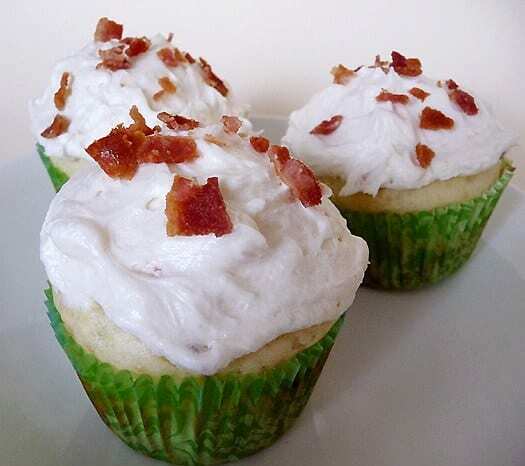 I was wondering if you could substitute half the butter in the pancake batter for bacon grease to give it a bigger bacon kick without overpowering the cupcakes with bacon bits, or would that just be too much? Also, I’m thinking of adding just a sprinkle of cinnamon on top to tie it all together. Hi Lisa, Yes, you could substitute bacon grease. Yum! These look delicious!! I wonder if you could use squash or sweet potato, too? That would be INCREDIBLE for a weekend, holiday morning with some strong coffee. :) Thank you, ma’am. This is really ingenious. God love you for giving us this recipe!! These sound sooo good! Should they be refrigerated if I’m planning on keeping them for several days? If you refrigerate them they may dry out. I would recommend eating them within a day or so of making them. If you need to keep them any longer, though, then yes, I would refrigerate them. I love this blog! I just found it and have loved everything made so far! Made these this morning to share at work. I never have whole milk in the house, so used 3/4 c evaporated milk and 3/4 c water. It is a pancake, not a cupcake — tender cake but I doubt it would hold over well so probably best made the day it will be served. This will be my buttercream method for ever and always in the future. I have never made such a light, wonderful buttercream. With or without the bacon, fab!! I chopped 3 slices and used a zip bag with cut corner to allow the frosting to swirl out (no problem with clogs). Brushed some maple syrup on a 4th slice during cooking and broke that into 12 larger pieces to decorate the top. Mmmm. will the bacon get soggy in the frosting? im making these for my church’s volunteers. they look SOOO good!!! Hi Mackenzie, If it sits overnight or something, it might get a little soggy, but if you frost these the same day you eat them it’ll be fine. I tried making these except with fat-free milk, and the cupcakes turned out very gummy and awful! They still tasted buttery (from the 2 tbsp of butter) and I had a lot of lumps in the batter…I guess I either need whole milk or at least 2%? Can I substitute fat-free milk and applesauce? Hi Marlene, I have never made pancakes (or this cupcake batter) with skim milk; usually always at least 2%, so you could start there. However, gumminess is usually caused from overmixing the batter. I am known throughout my office as the bacon girl. We are having a bake sale in a couple of weeks and this recipe will be perfect. Plus our family has a Bacon Party every year and I think I will make this for the party. We do almost 100 lbs of slab bacon cut thick on electric griddles. Has become so popular that each of my brothers and myself have to have the same type of party for our friends too. I think this cupcake will be absolutely perfect for that parties. Thanks alot! Ohhhhhhhhhhhhh… I feel like I demolished a pancake buffet… ouchie… but greatolicious! Done cooking. W/out frosting tastes like dull cakes, hot off the griddle. Hi! Last comment got deleted when viewing guidelines but basically said “cupcakes in oven smell delish love BBBBBBBBBBBBBBBBBBBBBBBBBBBBBBBBBBBBBBBBBBBBBBBBBBBBBBBBBBBBBBBBBBBBBBBBBBBBBBBBBBBBBAAAAAAAAAAAAAAAAAAAAAAAAAAAAAAAAAAAAAAAAAAAAAAAAAAAAAAAAAAAAAAAAAAAAAAAAAAAAAAAAAAAAAAAAAAAAAAAAAAAAAAAAAAAAAAAAAAAAAAAAAAAAAACCCCCCCCCCCCCCCCCCCCCCCCCCCCCCCCCCCCCCCCCCCCCCCCCCCCCCCCCCCCCCCCCCCCCCCCCCCCCCCCCCCCCCCCCCCCCCCCCOOOOOOOOOOOOOOOOOOOOOOOOOOOOOOOOOOOOOOOOOOOOOOOOOOOOOOOOOOOOOOOOOOOOOOOOOOOOOOOOOOOOOOOOOOOOOOOOOOOONNNNNNNNNNNNNNNNNNNNNNNNNNNNNNNNNNNNNNNNNNNNNNNNNNNNNNNNNN BACON X 1,000,000,000,000,000,000,000,0000,000,000,000,000,000,000,000,000,000,000,000,000,000,000,000 yada yada yada” but anyways love bacon.OOPS! I forgot to put will check back when done cookin’ bye. P.S. I <3 BACON!!!!!!!!!!!!!!!!!!!!!!!!!!!!!!!!!!!!!!!!! I made these a few days ago and they were a HUGE hit! My family (husband and two boys 6 and 9), neighbors and co-workers all loved them! I did cheat and just used my box pancake mix, but they turned out great! I took your advice and added 2T of maple syrup and 3 cooked strips of bacon to the pancake mix too, and they rocked! Makin the Irish car bombs this weekend, CAN’T WAIT!!!! Really good recipe! 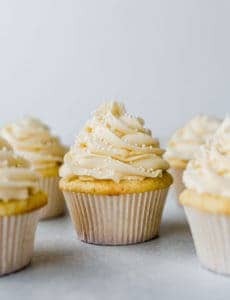 If you sprinkle imitation spice from places like tastefully simple on the cupcakes a few minutes before taking them out of the oven it sinks in just a little and gives it a little extra bacon kick! oh and if you use a sandwich baggie to frost them they turn out really nice! Thank you for posting these, I just ran across your site and it is now a new favorite!! Amazing cupcakes, my husband loves them! You know, I was thinking about this…if you put little bacon bits in there along with crushed maple sugar candy, wouldn’t it come out a bit like a McGriddle in muffin form? I don’t know about anyone else, but those are pretty tasty, and the idea of doing this is such a sweet, whimsical one! Ridiculously sweet (due to the icing) in the most perfect of ways. I give this recipe five stars! All I can think about is those cupcakes! I really have to try baking them! Thanks so much for sharing! Can’t wait to bake ’em. 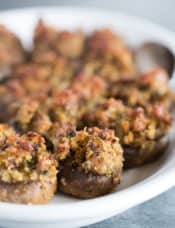 I just made these, and they were DELISH! It was a bit sweet on the frosting, but, overall, really yummy. I used Vienna Sausages instead of bacon and it turned out really good. Thanks again for the recipe! WOW these look amazing! Can’t wait to try this recipe – thanks for sharing! Wow. I made the frosting today for some bacon donut holes and YUM. It’s not overwhelmingly bacon-y so if anyone is worried about that then don’t. It’s just a lovely, unusual combination. Definitely a keeper! Thank you for sharing your creativity! I made these a few weeks ago, and they were a huge hit. Only one of my housemates wouldn’t try a cupcake, and he’s a very picky eater. Obnoxiously picky.